With Google Chrome 12, using a keyboard shortcut to open a bookmarklet on the Bookmarks Bar stopped working. As result ⌘1 wouldn’t open Quix anymore. Disaster. I spent a couple of hours on the Chrome extensions website looking for alternatives, but none worked as expected. I have already professed my love for Quix before, so I wont go into it again, just know that it is such an indispensable tool for my browsing/blogging workflow that I had to switch to Safari when it stopped working. The ⌘1 keyboard shortcut is hardcoded into my muscle memory. Launching the bookmark is the same as opening the link, so if your shortcut contains the CMD key, the bookmark will open in a new tab. Using Shift will result in the bookmark being opened in a new window. Somehow using the alt key does not trigger a force-download though, so only use Ctrl and Alt if you want your bookmark to launch in the same window. While I had tried adding ⌘1 before via Application Shortcuts, I never considered an alternative modifier, such as ⌃1. Go to System Preferences > Keyboard > Keyboard Shortcuts. 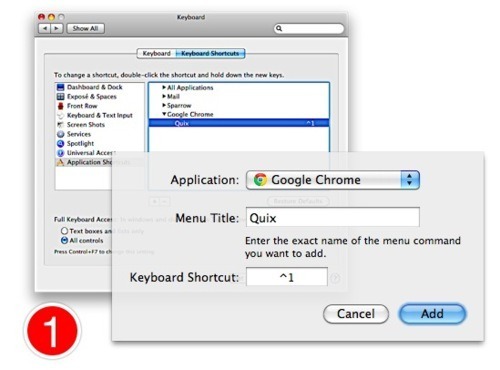 Select Application Shortcuts and click + to add a new shortcut. 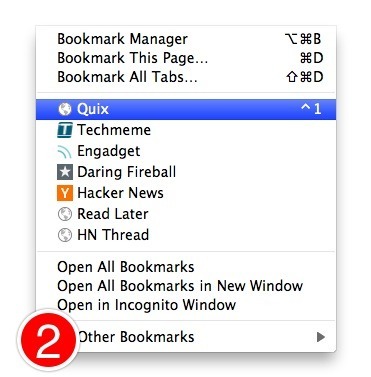 Pick Google Chrome exact name for the Quix bookmarklet. Just ⌃1 your way to productivity. An added benefit over the extension route is that the shortcut works even if the omnibar has focus. The switch from ⌘1 to ⌃1 will take some effort, but using the Keyboard Shortcuts pipes appears to be much faster than before, and I’m just happy that I can have access to Quix with an one keyboard combination again on Chrome.